The 1913 Pennsylvania Railroad map easily rivals Bachelder's Isometric Drawing of the battlefield of Gettysburg, in visual beauty, presentation, and in the amount of information conveyed to the viewer. The perspective of Bachelder's Isometric Drawing is that of an observer "in a balloon suspended in air two miles east of Gettysburg, looking west over the terrain." 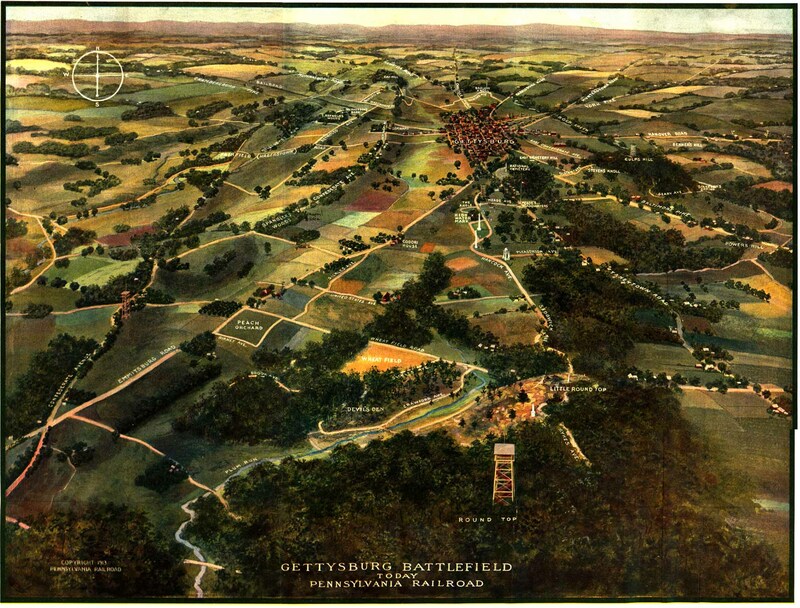 The Pennsylvania Railroad map portrays the field in a similar fashion with the observer suspended over the southern portion of the field, looking towards the north. Perhaps the most impressive aspect of Map 4 is the phenomenally detailed depiction of the battlefield as it existed at the time of the 50th anniversary of the battle. The lack of encroachment of woodland on the sight lines surrounding Plum Run and the Slyder farm are a striking contrast to the field seen today. So incredibly detailed is the pictorial representation that monuments such as the portrait statues of Buford and Reynolds can be seen on the first days field, as can the equestrian statues of Meade near Ziegler's grove and Hancock on East Cemetery Hill. Landmarks and features such as the Roger's House, Wentz house, Springs Hotel, Forney farm buildings, the 5 War Dept observation towers, etc. which have passed from the modern field can still be found on this time capsule drawing. The map measures 163/4 x 211/2 inches. It was scanned in 5 pieces and minor tears in the original were digitally repaired prior to being assembled into the map shown here. The map is from the collection of Terry Moyer. "John B. Bachelder: Government Historian of the Battle of Gettysburg", Sauers, Richard A., Gettysburg Magazine #3, July 1, 1990, p 116. 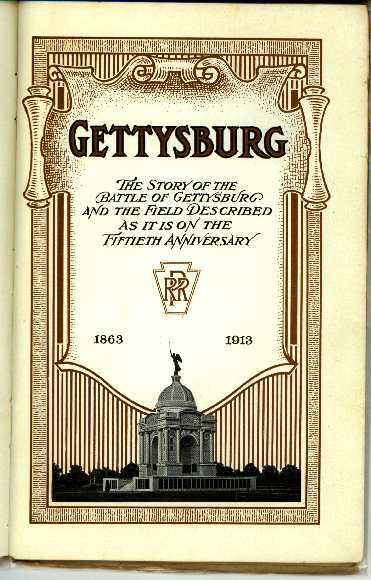 (page 5) In commemoration of the Fiftieth Anniversary of the Battle of Gettysburg, and for the especial benefit of its patrons who will visit the battlefield during the celebration this year, the Pennsylvania Railroad issues this booklet, containing descriptive matter, illustrations and maps. Those consulting its pages, will find a concise account of the movements of the Union and Confederate forces from the time Lee moved northward from Virginia to occupy the Pennsylvania valleys; the various engagements in and around Gettysburg. and a brief review of the retreat of Lee across thePotomac River, pursued by the victorious forces of Meade. A birds-eye map of the battlefield, on which the more important points of interest and the principal roads and avenues are indicated, will be a guide to visitors. 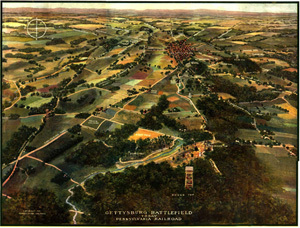 A map of the Pennsylvania System shows its relation to Gettysburg and the principal battlefields of the Army of the Potomac and the Army of Northern Virginia. Illustrations of various portions of the field and the monuments thereon round out the booklet, which it is hoped will serve to impress upon the mind the historic importance of this noted battle and the field on which it was fought. The unusually observant reader of this particular example of the Pa RR map may be surprised to discover a hand-written notation inscribed somewhere thereupon. Internal evidence in the booklet from which this map was digitized indicates that it was probably purchased by a Southern veteran on his way to attend the 50th anniversary reunion of the Blue and Gray. 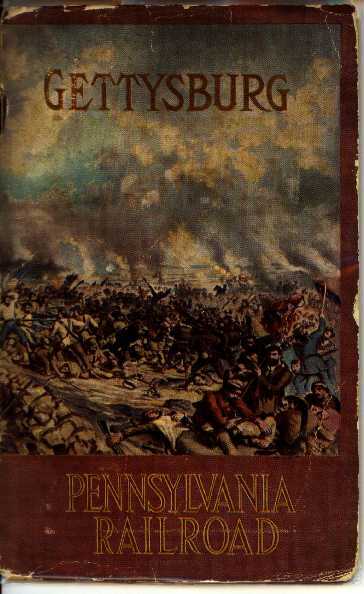 There are a number of photographs of the battlefield inside the booklet. There is a small 'X' pencilled along side many, though not all, of the photographs in the book. In one photo showing the 44th NY monument on Little Round Top, a small 'x' appears along side of the picture, with an additional 'x' written above the observation platform of the monument. Another photograph taken from Hancock avenue near the angle and looking south, has the notation 'Round Top' above the prominence of Big Round Top in the photograph. Another interesting comment can be found beside the picture of Spangler's spring, stating: "Stopped here and ate supper on tour of battlefield in busses". These annotations apparently represent the sites taken in by the veteran as he visited the various points of interest on the field. So what information indicates that this person was a southern veteran attending the reunion? The notation on the map is this: "* camped here". There is also a photograph in the booklet entitled 'The round tops as seen from the Confederate lines'. This photo also contains the notation "* camped here" written on the picture in such a way as to correspond with the notation on the map. The location of the camp area indicated is that part of the field that was reserved for the State of Virginia during the 1913 anniversary reunion.